I am intrigued by the play on one angle of the story in national media coverage of Gov. Christie’s climate denial – stories all based on the Bergen Record and WNYC investigative reporting on the NJ Transit fiasco (i.e. see this and this). The intriguing angle is the NJ Transit’s totally redacted 3 1/2 page “Climate Change Prep Plan” (see above screen shot). WNYC filed an Open Public Records Act (OPRA) request for the plan, and this is what they got (see above). I am intrigued, because I too filed an OPRA request – but I asked DEP for their Climate Prep Plans. I requested the Plans described by DEP Commissioner Martin in his December 3, 2012 testimony to the Senate Budget and Appropriations Committee, during the 3rd of their Sandy oversight hearings (you can view the hearing video here). First off, the state operates in emergencies based on planning, significant planning that occurs at the state level. Each department operates with its own plan, and ties into an overall unified command. We also work with coastal planning and areas of floodplains across the state. We are also responsible for handling water supply and wastewater treatment plants, and overall water quality. Nuclear safety … DEP is responsible for monitoring those plants in coordination with the NRC. I briefly would like to talk about 3 different categories. The first is before the storm, all the activities we were involved in; during the storm; then after the storm. First off, the number one thing we have, we all have a plan. Those plans have been in place. We’ve worked through different table tops, talks through those things, before in the past. So we’ve walked through, stepped through those things numerous times before this event. Each of my Assistant Commissioners has responsibilities and puts a plan together about what we are going to do before, during and after. So we break out those plans. A week ahead of time, we started putting these plans into operation. …. During the storm, we primarily provided technical expertise … on flood maps, where we expected flooding to occur, what those flood maps look like. Well, so it looks like Commissioner Martin was responsible for advising the Gov. on things like whether NJ Transit rail yards would flood. So, after listening to Martin’s testimony at that hearing, I filed an OPRA requesting copies of DEP’s plans that Martin claimed were in place and worked so well. The subject plans have not been finalized, are consider deliberative and confidential pursuant to N.J.S.A. 47:1A-1.1. In addition, some components of the plans are confidential pursuant to N.J.S.A. 47:1A-9, EO 47, N.J.A.C. 7:1D-3.2(b)1. Not been finalized? Martin testified that that they had long been inlace and DEP had conducted numerous dry runs. We didn’t even get the NJ Transit redacted 3 page version – but a flat out denial. We doubt the plans exist, and if they do exist, are probably a lot like the NJ Transit plans in terms of quality. For example, NJ sewage treatment and drinking water plants were knocked out because they lacked back up power, had inoperable diesel generators, or not enough fuel to run the generators. As result, many communities across NJ lost drinking water supply – NJ was on the verge of an even worse catastrophe. What kind of planning is THAT? In the wake of Superstorm Sandy, scientists now have a measurement of how sea levels changed over the past 10,000 years on the New Jersey coastline. The last time that sea levels were rising near their current rate on the state’s coast — roughly 3 to 4 millimeters per year — was 6,000 years ago during an unusually warm period with melting ice sheets, according to a study supported by the Department of Energy, National Science Foundation and National Oceanic and Atmospheric Administration. Then, the melting spurred from a combination of factors, including orbital variations and ocean circulation. The research confirms the current impact of climate change and provides further detail about how New Jersey is reacting to warming temperatures in comparison to other locations along the Atlantic Coast, according to the study’s lead author, Benjamin Horton, an associate professor at the University of Pennsylvania. The rate of sea-level rise can vary among Delaware and New Jersey and Florida, said Horton. “New Jersey now has the most detailed sea-level record for the last 10,000 years for anywhere along the Atlantic Coast,” said Horton. The research was published in the Journal of Quaternary Science. By examining 20-meter-deep cores taken from marshlands along New Jersey’s coast, the research team determined that sea levels rose 4 millimeters per year on average from 10,000 to 6,000 years ago. That coincided with melting of the world’s ice sheets. “Now what’s happening? Greenland and Antarctica are melting and could trigger similar rates of sea-level rise,” Horton said. As the climate gradually stabilized, sea-level rise tapered off — from 6,000 to 2,000 years ago, the rate was 2 millimeters annually. Between 2,000 years ago and 1900, the New Jersey rate was 1.3 millimeters a year, the scientists said. 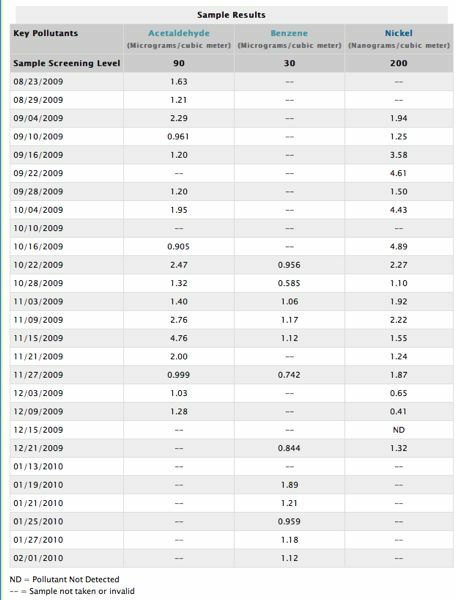 The last figure is noteworthy because the rate has doubled since the beginning of the 20th century, largely because of climate change, according to Horton. From the fossil record, the researchers also determined how non-climate factors are playing into rising water levels along the state’s coast. 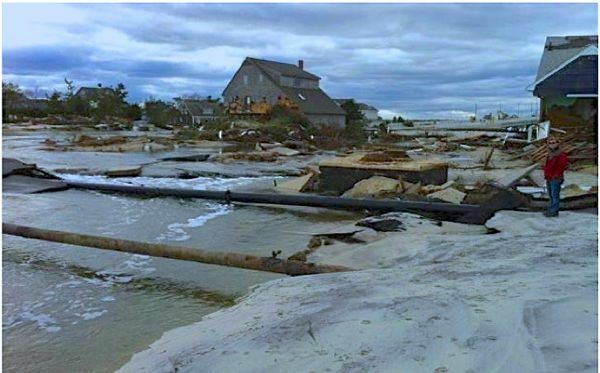 Of the roughly 3 to 4 millimeters of annual sea-level rise now, about 1 millimeter of that in New Jersey is caused by geological land subsidence, said Horton. “We were only able to determine what that value was from going back through time,” he said. The scientists made their conclusions by measuring the abundance of small organisms that are very sensitive to changes in salinity. They also used new methods, such as consideration of sediment compaction, that make the measurements more accurate than prior estimates, according to Horton. Last year, scientists at the U.S. Geological Survey reported that sea levels along a 600-mile “hotspot” between Cape Hatteras, N.C., to north of Boston have increased three times the global average since 1990. Breaking! Logjam in Hazardous Waste Site Cleanups Is Broken! Bet you didn’t know that the logjam in hazardous site cleanups was broken back in 1989, by a “public-private partnership” known as Clean Sites, Inc. (that’s Washington DC beltway spin for a corporate front group). Keep in mind that Clean Sites Inc. was formed in 1984, at the height of the “Reagan Revolution”, i.e. “government is the problem, not the solution” – and the deeply ideological, anti-regulatory, anti-government 94th Congress’ “Contract on America”. The group now appears to be defunct. The last financial return for the 501(c)(3) registered non-profit group was filed for the year ending June 30, 2000. It revealed that the group had no income in that year. However, in the decade before, Clean Sites had run a significant operation. Or that President Bush’s (I) EPA Administrator William Reilly did that good deed, in altruistic pursuit of sound public policy. So, what’s the current relevance of this 25 year old information? Lisa Jackson’s revolving door move to Apple prompts me to mention something I’ve been meaning to clarify for a long time. I’m further motivated by the way the issue is simply buried on Lisa Jackson’s promotional Wikipedia page. I am referring to the literally never mentioned fact that Jackson began her career at Clean Sites, Inc., a corporate DC Beltway front group – funded by and serving the chemical industry – who worked hard and effectively to rollback the federal Superfund program. This reality directly and completely undermines the myth that Jackson is some career government technocrat that worked her way up the EPA food chain to attain high office. Lisa Jackson began her career at Clean Sites, Inc. – something that is virtually never mentioned in her biography. II. Resource Development: Initially, CSI is to be funded by contributions from industry and from foundations. The strategy has been to show a strong chemical industry commitment which is then extended to other industries that generate hazardous waste and then to approach foundations to request support for a very specific piece of CSI activity, probably the Technical Review function where independence of function should probably be matched by some “independent” funding. Of course, it is likely that as CSI develops, companies who utilize its services will contribute to the operation. For now, the chemical industry is moving quickly to support half of CSI’s costs for the first three years. The materials found under Tab II explain how this process works. The key documents here are the commitment forms on which CMA companies commit on the basis of chemical and chemical product sales. The formula used assumed full support from the chemical industry and was calculated to yield $2.5 million in year one, $3.5 million in year two and $5 million in year three. From day one, Jackson always had a firm understanding of and close affinity with corporate economic interests. From day one Jackson had powerful political connections that obviously opened doors for her. The perspectives, training, and contacts forged in places like Princeton and Clean Sites Inc. are the values that are rewarded by the political culture in government agencies, which has become increasingly corporate, increasingly captured by corporate interests, and prone to revolving door incentives and abuses. Those “careerists” in agencies that manage to advance know exactly how to play the game – don’t make waves. If a bureaucrat in an environmental agency should step out of line, and buck management to become an “advocate” of science and the public interest, that would amount to isolation, marginalization and pariah status – career suicide. Jackson attended Tulane on a scholarship from Shell and went to graduate school at elite Princeton University. Of such humble origins, corporate culture is fostered, corporate values reinforced, corporate capture is founded, and the revolving door swingeth. So I am not surprised by the Apple move. The move to Apple returns full circle to Jackson’s origin in corporate America. And that, my friend, is a storyline you will never hear in any mainstream media outlet – or whispered by any environmental group. Ahem .. wait a minute, but what about this? BRICK — The natural gas fires that have burned for days along the ravaged barrier islands, spanning from Bay Head south to Seaside Park, and also Long Beach Island, are about to be snuffed by New Jersey Natural Gas, the company said this afternoon. BRICK — The arduous task of rebuilding along the barrier island in Brick Township will be halted next week, officials said. For five days beginning Monday, residents and contractors will be prevented from getting on an approximately three-mile portion of the island as repaired natural gas lines are pressurized, officials said today. I could go on – but think I’ll stop now. We’ll let the experts push on. Lies by the chemical industry about the environmental and health effects of their products are nothing new – entire books have been written about that (e.g. see: Doubt is Their Product – How Industry’s Assault on Science Threatens Your Health by professor David Michaels). But, those lies have become much more nuanced and sophisticated, typically requiring scientific and legal expertise to detect and expose, as professor Michaels did so effectively in his superb book. 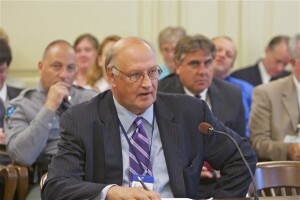 So, I’m actually happy to report, that nuance and sophistication were not the case recently in Trenton, when Hal Bozarth, chief lobbyist for the NJ Chemical industry (AKA “The Godfather of NJ Toxics”), repeatedly and obviously lied and mislead in testimony to the Assembly Environment Committee on an environmental justice bill, A3836. I’m happy to report those lies and distortions because they open the door and become an opportunity to educate legislators and media on long ignored and complex scientific and regulatory issues. Ironically, Bozarth’s testimony was so egregious that it actually advances the compelling arguments in favor of the bill. US EPA and NJ DEP studies have found that air quality is no worse in urban NJ than elsewhere in the state. So, let’s get right down to it and start with what the bill does and exactly what Bozarth lied about in his testimony. The key technical feature of the bill involves what the wonks call “cumulative impacts” or “cumulative risk”. The bill would authorize DEP to deny environmental permits where consideration of cumulative impacts pose unaceptable risks. Apologies for delay in providing this information, which I promised during my May 13, 2013 testimony before your committee on your bill, A3836. As I testified, Mr. Bozarth’s testimony was false and/or misleading. As promised, I now would like to followup in more detail to point out specifically where the testimony of Mr. Bozarth of the NJ Chemistry Council was false and/or misleading in statement or inference, as follows. Lies and distortions by the chemical industry about the environmental and health effects of their products are nothing new – entire books have been written about that subject (e.g. see: Doubt is Their Product – How Industry’s Assault on Science Threatens Your Health by professor David Michaels). There are also relevant science, regulatory, and policy documents that Bozarth failed to mention that I will touch on briefly. 1. Mr. Bozarth testified that US EPA and NJ DEP had conducted cumulative risk studies in Elizabeth, Paulsboro, and Paterson, and found no cumulative risk problems, inferring that there were no “unreasonable risks” the bill sought to address. Both statements are false and misleading, as set forth below. 2. Directly contradicting that statement, he then testified that scientific tools to assess cumulative risk do not yet exist. 3. Bozarth stated that those studies found that air quality is urban areas was no worse than in other areas of NJ. THis statement is false according to DEP data in the Report cited by Mr. Bozarth, as set forth below. The Elizabeth (Mabel Holmes Middle School) and Paulsboro (High School) studies were conducted by US EPA. These studies did not assess or include findings on cumulative risk, as stated by Bozarth. The EPA schools study did not emerge from within EPA professionals or a credible scientific body, and the study itself reflects inadequate scientific development and vetting made difficult by political intervention. The EPA study methodology did NOT conduct cumulative impact or cumulative risk assessment, but instead was based on air monitoring and individual chemical specific analysis, based on a comparison with EPA derived health screening values for individual chemicals. c) EPA screening values were over 200 times HIGHER than NJ DEP health based screening values. If EPA had used NJ DEP’s screening values, almost all samples would have exceeded health levels of concern. For example, EPA used screening values of 90 micrograms/cubic meter for acetaldehyde and 30 micrograms/cubic meter for benzene, a known human carcinogen. d) the EPA selected pollutants that are emitted by mobile and stationary sources, making it difficult or impossible to determine the source of the pollutant detected with any degree of confidence. Accordingly, Mr. Bozarth’s repeated claims that the large majority of the pollution comes from mobile sources finds no basis in this particular study. First of all, in contrast to EPA studies above, the Paterson DEP UCAMPP study initially WAS designed as followup “environmental justice” research project and the final draft Report did include cumulative risk assessment findings. But, as I wrote on February 10, 2010, those and other important findings were deleted from the version released to the public. This amounts to political suppression of scientific findings, a corrupt practice that has no place in government. Secondly, the Paterson study used an air monitoring station located in Chester, NJ as a “background” station. 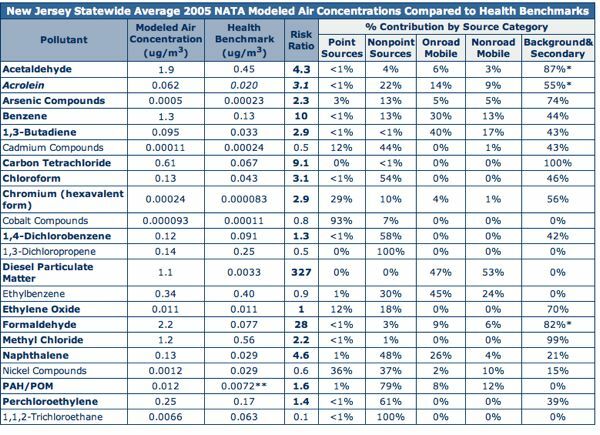 Contrary to Mr. Bozarth’s claim, according to DEP’s data, the air in Chester NJ is far less polluted than the air in Paterson, and the people of Paterson are exposed to significantly higher health risks from air pollution, compared to residents of Chester. As some others testified on your bill, this is the definition of “separate and unequal”. “DEP considered 9 indicators of environmental and/or public health impact: 1. cancer rates; 2. diesel emissions; 3. ambient benzene levels (a carcinogen); 4. traffic (all); 5. traffic (trucks); 6. density of DEP regulated industrial facilities; 7. density of toxic waste sites; 8. density of dry cleaners (toxic air emissions) and 9. density of junkyards. Mr. Bozarth implied that cumulative risk is not developed scientifically or in regulatory policy. Yet EPA has had a cumulative risk assessment framework for over a decade. For NATA, the estimated exposure concentrations are not considered to be upper bound. Rather, they represent central tendency estimates of exposure concentrations for each demographic group at the geographic unit of analysis (e.g., the census-tract level). Because cancer slope factors are not “most probable estimates,” however, but instead are 95-percent upper confidence intervals, summing traditional risk levels can cause the resulting sum to overestimate a 95-percent upper confidence level risk for a mixture. 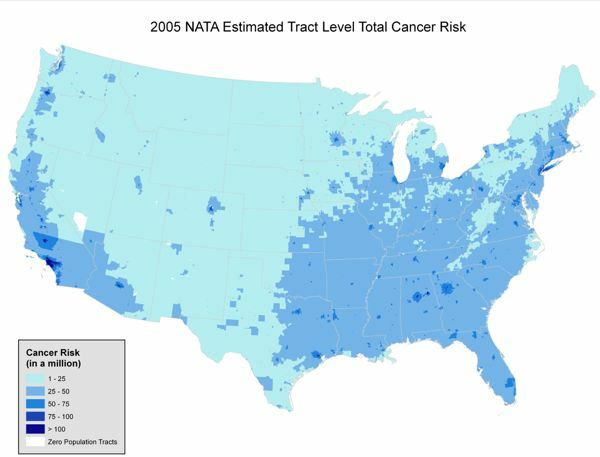 The NATA approach assumes an additive effect from simultaneous exposures to several carcinogens. Summing cancer risk estimates is not appropriate when effects from multiple chemicals are synergistic (greater than additive) or antagonistic (less than additive). I would be glad to expand upon or discuss these important matters at your convenience. For interested readers, the EPA national school ambient air monitoring initiative sampled outdoor air quality for a handful of pollutants at two NJ schools – hit the links for one in Mabel Holmes Middle School in Elizabeth and one in Paulsboro High School. A summary of the EPA initiative can be found here, the sampled pollutants here and the actual results here. The respiratory hazard index was dominated by a single substance, acrolein, which contributed about 75 percent of the nationwide average non-cancer hazard. The respiratory hazard index exceeded 1.0 for approximately 69 million people while the HI exceeded 10 for more than 174,000 people. These estimates for acrolein differ greatly from the 2002 NATA estimates. This is primarily due to the removal of fires, which were a big contributor of atmospheric acrolein in 2002, from the 2005 inventory and assessment.